Double Bull Archery has combined the optimum wind resistance and stability of their T5 blind with the infinitely adjustable viewing of their Matrix blind to create their best ground blind yet! The Dark Horse's winning combination of features means you no longer have to choose between stability and visibility, making you more dangerous in the field. Enjoy a full 180° (six foot-plus) of shooting opportunity across the front of the Dark Horse thanks to Double Bull's Silent Slide window system. Adjustable from 1" to 20", you can leave the Silent Slide window open or cover it with shoot-through netting. Netting system is designed to let the hunter peek through the top for a clear line of sight if needed. With a black interior to maximize your concealment, you don't have to worry about game spotting your silhouette or profile. Custom cotton/poly exterior is weather resistant, silent, and won't shine. Four shooting ports and two viewing ports open up the area behind your blind to hunting as well. A convenient and durable fiberglass frame system lets you set up the Dark Horse in seconds! 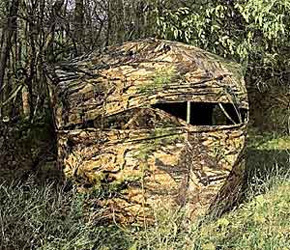 Blind includes a five inch wrap around flap that forms a tight seal with the ground to block scent and light from escaping the blind. Add to all of these features the world's first camo pattern conceived specifically for a blind--Pattern Masters™ Ground Swat™--and you'll have one of the most effective blinds in the industry. Weight: 20 lbs. Footprint size: 5' x 5'. Hub to hub size: 6'6"W x 5'7"H.
Silent Slide Window System adjusts from 1" to 20"